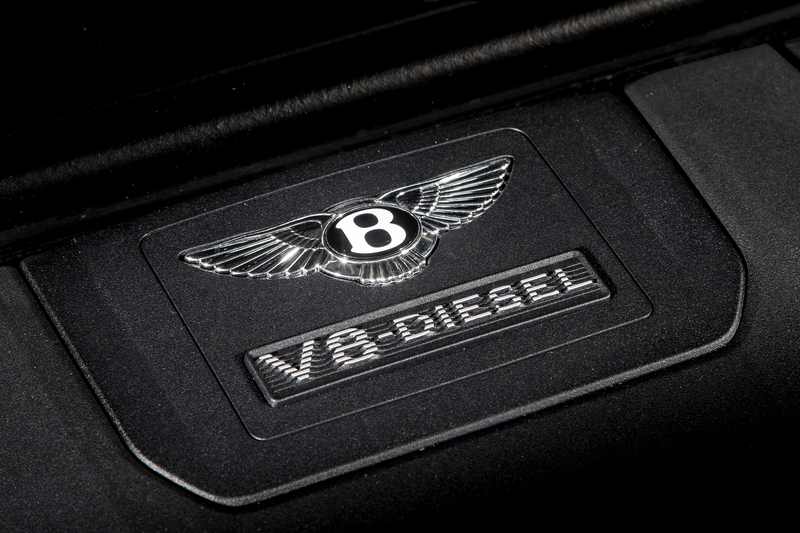 Bentley is one of the few motoring marques that could be considered automotive royalty. Despite its German custodians, it remains resolutely British, with a proud heritage to match. 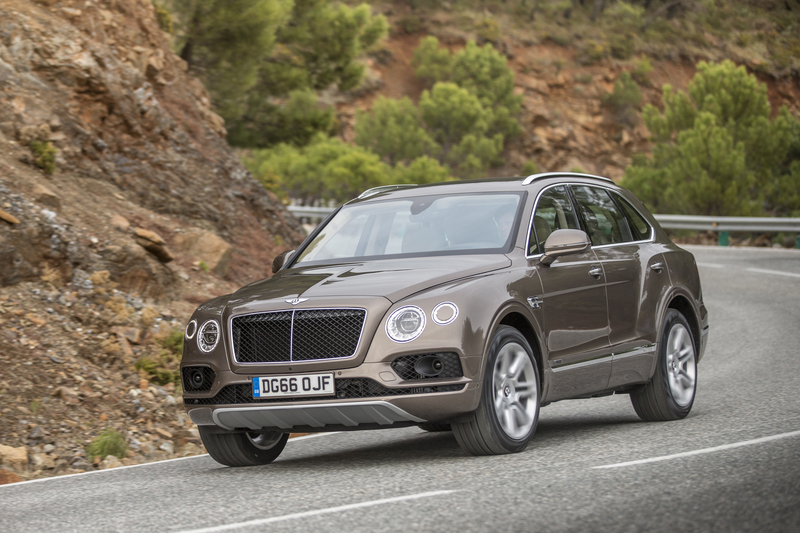 But can Bentley’s take on the SUV formula retain that regal dignity? The road that leads south from the outskirts of Villiersdorp to the N2 between Caledon and Botriver starts off innocuous enough: a slightly bumpy tar ribbon that scythes its way through farmland, while linking the occasional gentle curve to long, languid straights. After crossing the Theewaterskloof Dam wall, it even becomes a dual carriageway for a few kilometres – an ideal opportunity to make short work of any slow traffic before the road reverts to a single lane. Then, as you crest the final rise, the road rudely plunges down the hill and leads you on a roller coaster ride of off-camber corners, blind rises and heart-stopping undulations. It’s a thorough test of man and machine, as long as the pilot is brave, and the machine is agile. 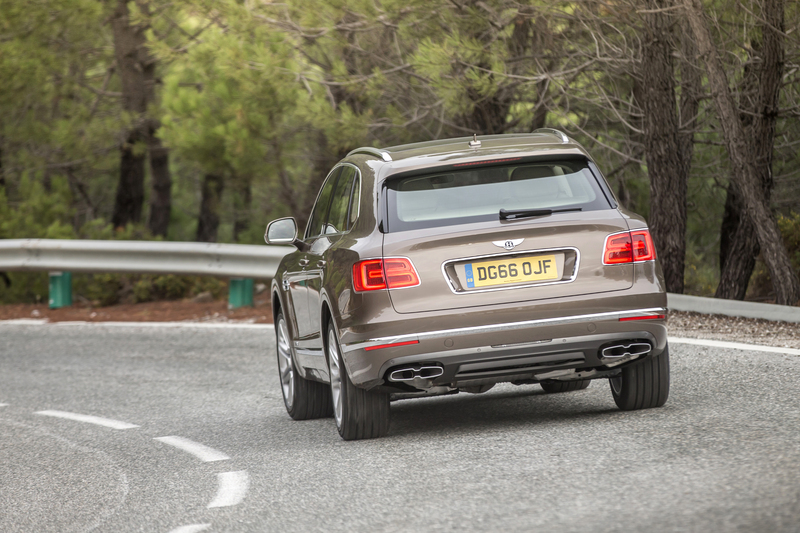 At face value, the Bentley Bentayga Diesel is not an ideal candidate for these conditions. It’s a corpulent beast, even by big SUV standards – and at 2.5 tons-plus, a heavy one, too. How big? Think 5.14 metres long and just 2mm short of 2m wide, excluding the mirrors. It stands tall, too: the roofline measures 1.74m at its highest point. But this is not an opportune time to mull over the Bentayga’s measurements. We’re hurtling downhill, gaining momentum faster than Akani Simbine, while what seemed like a gentle curve to the right is sharpening into a gravity-testing corner. My instinct tells me now’s a good time to come off the gas ever so gently, and to adopt a more circumspect pace. But the big Bentley feels so confident, so planted, that it seems a pity to spoil the fun. The descent is halted by a sharp, suspension-testing dip that would unsettle a lesser vehicle, and then adopts an upward trajectory fast and steep enough to make the SUV feel more Boeing than Bentley. It takes the challenge in its stride with a dismissive ease that is both surprising and satisfying. And as it continues to carve up the road ahead with real appetite, it’s clear that there’s more to this Bentayga than bespoke luxury on wheels. True to a performance heritage that harks back to the Bentley Blower and the Bentley Boys (let alone its more recent Le Mans 24 Hour victory, its current GT3 endurance racing success and a new Pikes Peak hillclimb record), the Bentayga can give it horns! 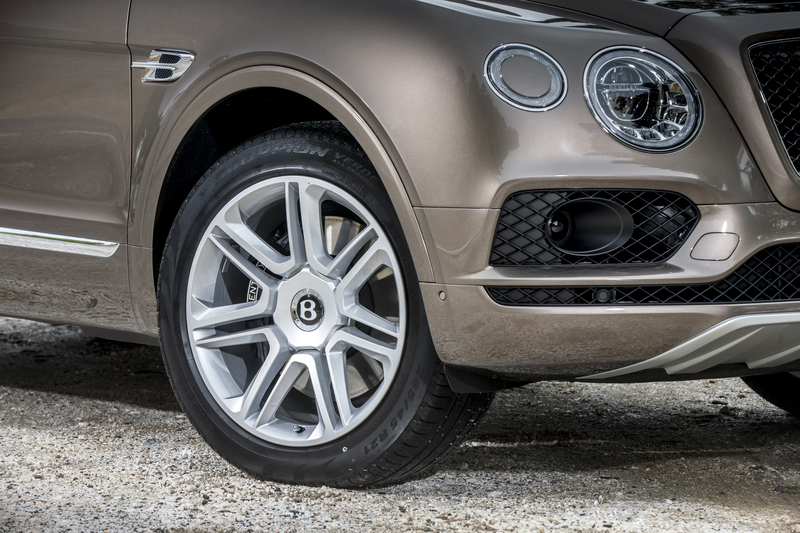 Frankly, it’s not why your typical Bentley buyer will opt for the Bentayga. Nor it is likely to be driven with such vigour. But it adds an unexpected element of dynamic appeal to a marque more often acknowledged for its luxury and craftsmanship, than its hell-for-leather capabilities. 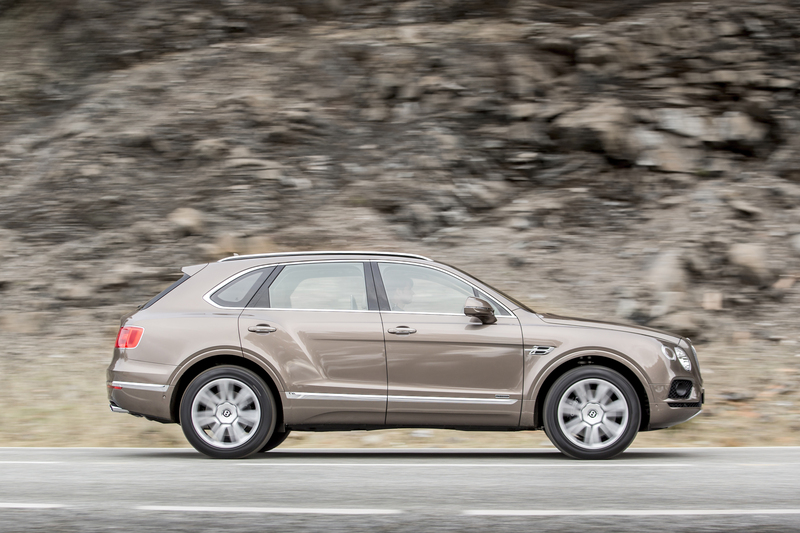 The Bentayga is further proof that the SUV phenomenon isn’t limited to utilitarian family transport. It expresses the notion of exclusive limousine motoring in an all-wheel drive, raised-body context that adds both versatility and practicality while remaining irrevocably Bentley. 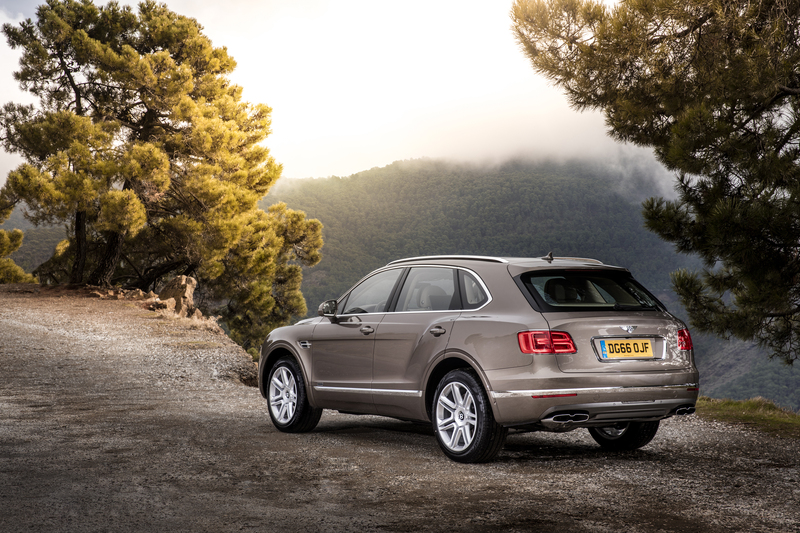 That’s quite a feat, given that the Bentayga shares its lightweight aluminium platform with the Audi Q7. But its application here is miles removed from Ingolstadt: this is very much a proud product of Crewe, where craftsman have hand-fettled Bentleys for generations. Under the careful stewardship of the Volkswagen Group, the dichotomy between bespoke craftsmanship and cutting-edge technology has been a consistent Bentley hallmark. There are some SUV-related aesthetic compromises, though. 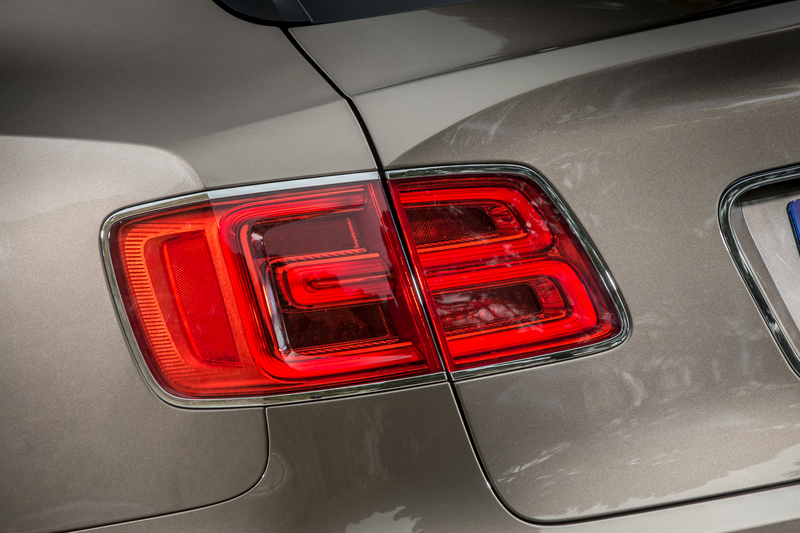 It’s hard to disguise the sheer size and presence of the Bentayga, and viewed in profile, there’s an inevitable plumpness to the rear. The front is more appealing, predictably dominated by the huge but finely filigreed grille. 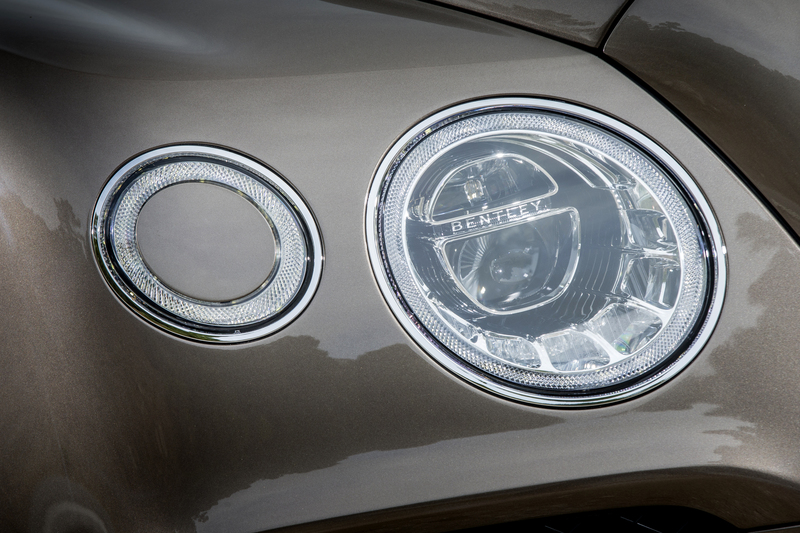 The spherical LED headlights are a modern interpretation of a familiar face, and subtle brand details abound: from the nomenclature subtly applied to the headlight elements, to the lateral air intakes and taillight clusters mimicking the Bentley ‘B’. Rear-on, the scalloped tailgate (motorised, of course), the unusually shaped exhaust extensions and the subtle roof spoiler create visual interest, while big 20-inch alloys and fat rubber suggest decent traction. 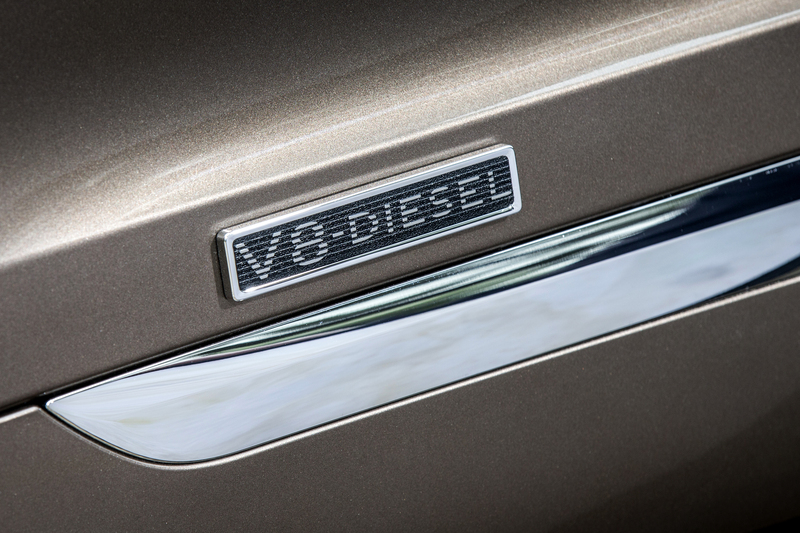 This may be a turbodiesel, but there’s nothing agricultural about the drivetrain. The 4.0-litre V8 is a brand new design, and links two sequentially activated turbochargers to an electric compressor to deliver the seamless stream of urge Bentleys have become renowned for. The output stats suggest just that: with 320kW of muscle and an eyeball-popping 900Nm of twist, the Bentayga will effortlessly shrug off the effects of its considerable kerb mass. It also means that the all-wheel drive system is a necessity to cope with the combination of power and weight. It optimises traction across both axles, contributing to an impressive level of composure, almost regardless of speed or road conditions. It takes less than five seconds for the Bentayga to sprint to 100km/h, and 11.3sec to get to 160km/h. Top speed is 270km/h, even if that statistic remains largely irrelevant on our roads. 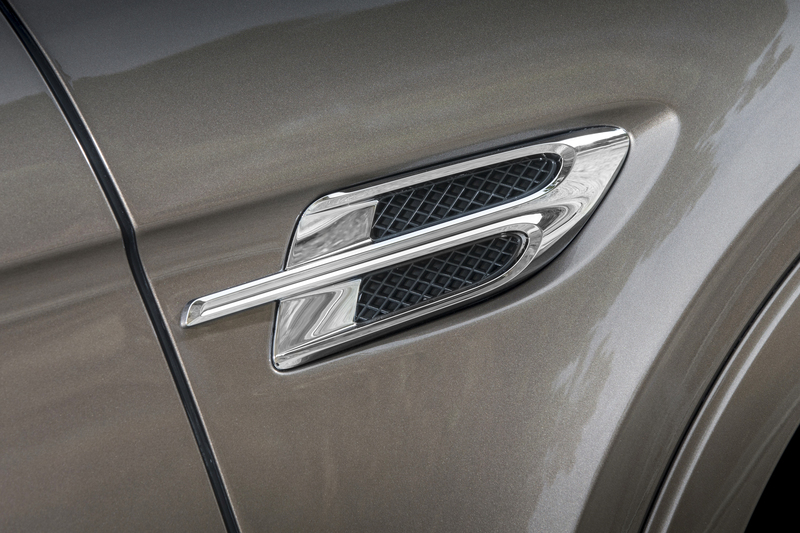 Instead, it’s the unflappability of the Bentayga that is its most endearing trait. Pressing on, as I’ve just experienced, is well within its portfolio of capabilities, and it will cope with bumpy country roads far better than any tautly sprung supercar. There’s no real sense of hard acceleration when you bury the throttle: just a relentless flow of power that propels the big machine towards the horizon with unceasing zest. The combination of a commanding seating position and the sheer size of the Bentley underplays just how rapidly it gathers speed, and how briskly it covers ground. Given its all-wheel drive, 240mm ground clearance and a host of off-road driving modes, the Bentayga is also perfectly capable of swopping tar for gravel. It’s no gung-ho 4×4, but its all-terrain talents do come in handy when heading off to that private game reserve, or dealing with increasingly potholed country routes. For many – most, even – the careful interior execution, the plushness of the cabin, and the comprehensive equipment list will weigh heavier than the Bentayga’s almost unexpected dynamic talents, and its go-anywhere versatility. It’s a bespoke space, resplendent in carefully mirror-matched wooden veneers, hand-stitched leather and finely knurled metalwork. This is where the Bentley heritage shines through; where the careful attention to detail eschews any notion of mass-market production. It takes a single craftsman nine hours to hand-stich the leather covering onto the Bentayga’s multifunction steering wheel, and 38 hours to trim a single seat. The veneers are lovingly polished to a high gloss, and the brightwork isn’t dressed up plastic, but the real thing. Not there’s nothing old-fashioned about the cabin. A touchscreen colour display neatly nestles in the veneer-trimmed dashboard, providing access to all the latest tech: from satnav and Bluetooth to multispeaker audio and a detailed trip computer. To be fair, Bentley would have done well to borrow Audi’s MMi system to augment that touchscreen, which isn’t always intuitive to use, but that would have added more switchgear to an otherwise uncomplicated control array. The analogue dials doff a hat to tradition, but there’s a digital speed display, too. And while the clock is an analogue timepiece, the gear lever offers a sequential action, and is partnered by shift paddles. Add the head-up display, night vision system, parking assistance, and a veritable arsenal of active and passive safety systems, and it’s clear that tradition and technology are in perfect equilibrium. For those with a penchant for good sound, Bentley offers hi-fi audio on wheels, courtesy of British high-end audio marque Naim. The 18-speaker, 1,800 Watt system makes full use of the whisper-quiet interior to deliver a level of sonic performance better than most of us lesser mortals have access to in our living room. 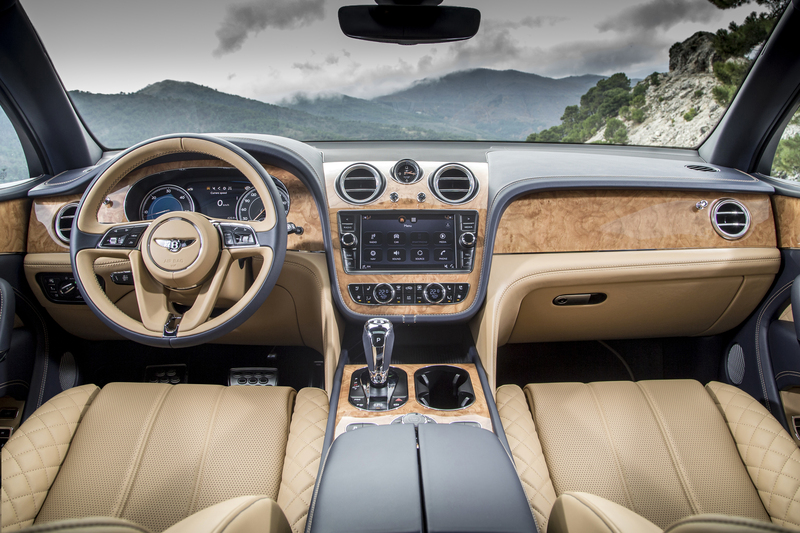 Given the Bentley SUV’s generous dimensions, the spaciousness of the interior comes as no surprise. Depending on requirements, it can be configured as a four-seater, five-seater or even seven-seater – although the latter arrangement compromises an otherwise capacious luggage compartment. As a four or five-seater, the Bentley’s rear accommodation is limo-style generous, and can be kitted out with a rear entertainment system that adds dual flat-screen digital displays and high-quality wireless headphones to the equipment list. Indeed, the list of options is almost limitless, including various Mulliner-executed packages, thus allowing individuals to create a truly bespoke model reflecting personal taste and requirements – at cost, of course. I’d wager that many a Bentayga owner would be more than content to spend most of the time in the rear seat, cocooned in uncompromising comfort, than behind the wheel. But that would be a pity. As much as the big SUV is supremely comfortable, uncompromisingly luxurious and painstakingly executed, it’s real appeal lies in its breadth of capability. Regardless of road conditions, payload or driver demands, the Bentayga delivers with serene confidence. Serene and effortless – but indecently quick.